Thank you to everyone for money and offers of help and support. We are having trouble with the email connection, but I have received some reports by fax. Some of it is a little unclearly formulated, and I am not quite sure what it means. Therefore, I will copy them directly, so you can get an impression of the situation. Today I have visited to lot of places in Galle Town & I’ll give you the details of Hotel Happy Banana. The hotel was completely damaged & all the goods were washed away. I have met Mr. Janath & he was started to clean up the place. But he is worried and said that he don’t know where to start & what to do. Mr. Janath’s family was safe but his receptionist was dead & the body was found inside the hotel premises. Herewith I’m sending the pictures of the Happy Banana Hotel. I’ll give more details of our visit to Galle town tomorrow. Yesterday I came to the factory about 9.30 a.m. & I went to the bank to withdraw cash to pay last months salaries. After that I visited various places in Galle like Aurvedic Hospital & Hotel Happy Banana, etc. Regarding the Happy Banana I have sent you the details as well as the pictures through e-mail at 5.26 pm yesterday. 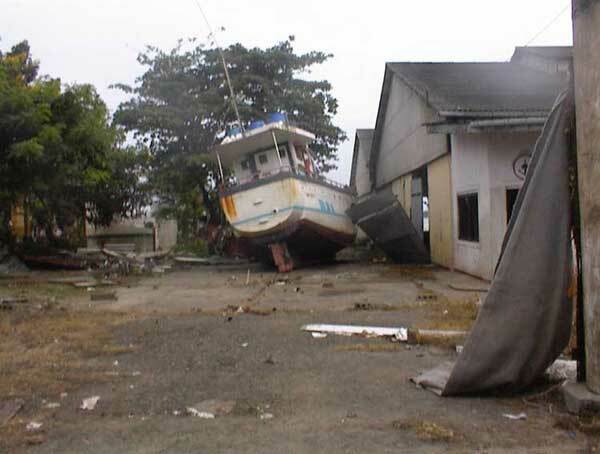 It is in front of the sea & I think that they have heavy damages. But I couldn’t contact the person to get details. The picture is not very clear but the Stadium was damaged for the waves. It was completely destroyed for the waves. It was heavily damage due to the Tsunami Waves & they started cleaning work. It was damaged & we couldn’t get the details because there were no people in the premises. I have visited to the Hospital & met Dr. Manjula & she showed me the damages happened to the Hospital. The ground floor, Laboraty, Kitchen & stocks of medicine washed away due to the waves. As per Dr. Manjula the Government is going to condemn the Building. Two paralyzed patients were dead in the hospital due to these waves. Due to the information I got most of the disable children’s lives have taken by the waves. 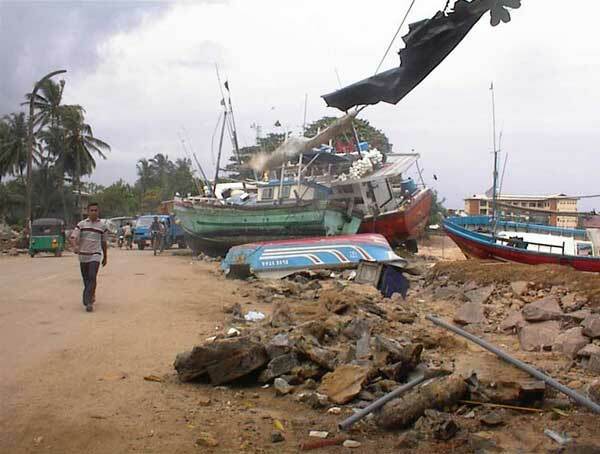 I have seen lot of small & medium hotels destroyed by the waves in Unawatuna. One small Hotel building was three quarterly sunk in the sand. There were no heavy damages to UBR. was completely destroyed & only the Buddha’s Statue is safe. All the factory staff was safe including Ranjan. But there are problems for Tharanga, Daminda’s family. I was not visited the Ranjan’s House in Galle. But he said that there were no damages to the house and the goods. He seems to be little disturbed and I told him if there anything to tell me and not wait till you comes. Now he is in Bataduwa House. Tharanga’s sister’s Son was missing on 26th. They have visited to Matara Town and when the waves come they ran. But unfortunately this 06 years old boy was got caught to the waves and up to now have not found him. They are still finding him. She is also little disturb from this. At the time this letter is preparing she got a call from home that the body was found & she went home to go for the funeral. Daminda’s cousin Brother’s wife and the child were missing too. As told by Daminda this family was gone in their car to Magalle and they were buying fish at the time waves comes. Cousin brother was rescued and Wife & child were still missing. Here with I am sending the reports of Mr. Ravindra & Mr. Surendra. The shop was closed and we could not meet the owner. There are not so damage to the building or doors. Tomorrow they keep their stocks in the up stair and few items of each kind of paint in the 1st floor. I expect that they are also having some damages but not big things. I tried to meet Mr. Jayawardena but it failed. I expect that he may had a big damage to his shop. Lot of power tools, machines and other valuable electrical and electronic items were in the 1st floor and I think many of this items damaged by sea water. I saw his place and I could contact him over the telephone. He told a big story with me and the summary is that they lost lot of their property. He has had five vehicles including the Morris Oxford and he has to repair all of them. At present they are lining at Kaduruduwa (close to Imaduwa road) and he expect that it will take quite some time to move there place. He also told that he is not in a position to e-mail you because all the computers and other accessories are washed out by sea water. Further he told that if you want to help him, he is pleased to have it. He told that if you can bring some material for him it also a big help for him. I spoke to Mr. Surendra in this morning, over the phone and he told that himself, his relations, his staff and his property are totally out of trouble. I tried to contact D.K.W. but it failed. So then I asked from Mr. Surendra about D.K.W. and he told that they are also out of trouble. I tried to contact Mr. Gihan who owner of Reliable Motors but he was not there. So I asked from the lady who answer the phone about the situation and she told that there are small damages to their shop. She was not in a position to tell further details about the damage. It has damage to the building and other property. At present they are function the business in a temporary building away from Galle town. He expects that with in 04 days they can come to Galle town and supply our requirements as usually. Also he told that he is having few Oxygen and Acetylene Cylinders with him if we are really need, he can supply few for us. It has damaged to the 1st floor. Many of fast moving items were there and when we visit the shop they are trying to select the usable goods and clean them. The owner told that still he cant estimate the damage he has had. It will have few days to them to get start the business. I think you know about our disaster to some extent. Now whole costal area around the total island (about ½ Km from shore) is faced to complete washout. It is like after 2nd world war. The death rate is 28.500 and is still rising. There are some known people among the dead. Our tourist industry is in complete disaster. Lot of tourists are dead. 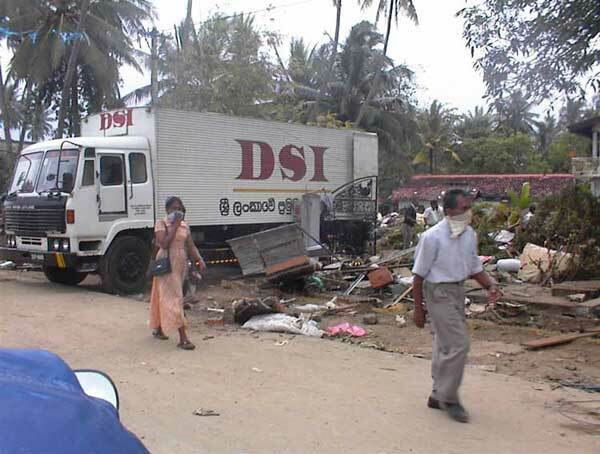 There were mass funerals at Galle, Matara, Hambantota, Ampara, Batticlo, etc. Since I know most of the people and places mentioned, I can read a lot between the lines, and I sense that the reports are somewhat understated. What is directly stated is of course enough. It all feels less intimidating when I focus on the people I know, and can see that we can help them directly and effectively. It is important to get as many as possible back in motion again. It is a lot cheaper to save a job, than to create a new one. As a side effect, a simple greeting or inquiry has renewed the courage of many. They feel helpless in the midst of chaos, and just knowing that someone remembers them and that they are not alone, means a lot. When we get the pictures I will update again. Yesterday was the first banking day after announcing the fund raising account, and the money is starting to come in. I hope many will contribute, so we can do something to get the wheels back in motion again in Sri Lanka. Every penny will make a difference. I am getting more and more information from Sri Lanka, but unfortunately much is contradictive, so I can't be too specific here. The phone lines are still somewhat unstable and poor. 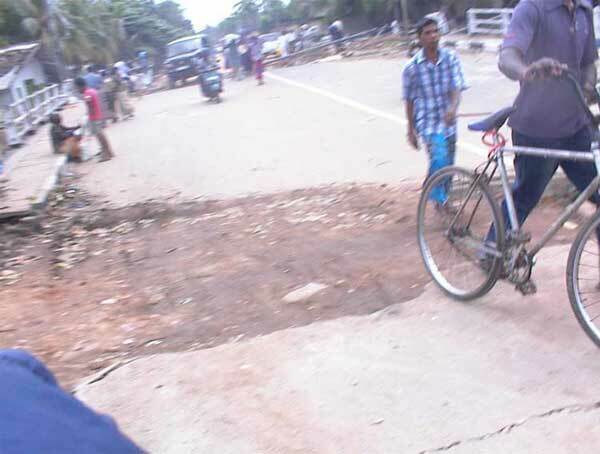 Help has reached Galle in great quantities, but it is still hard to get a clear picture of the situation. My general impression is that many have overcome the first shock, and are now at work cleaning up and saving what can be saved, but that even more still can't manage thinking of the future, and do something for themselves or others. Many still stay in camps with nothing to do. Many children are now orphans. When you hear about the horrible situation in the media, you feel powerless and unable to do anything besides sending money. It feels good to know that we can help quite many put their lives back together again, and I don't feel quite as helpless as the first days after the disaster. Many have offered to do something to help, and if anyone has any ideas let me know. All I can think of is that everyone can "promote" this fund raising, and I encourage all who can to give a donation. The formalities are now in order, and I have permission from the police to collect money for helping in Sri Lanka. So if you, your friends, relatives or colleagues would like to make a donation, please transfer the money to account: IBAN nr. DK8777380001094869, SWIFT adr. VEHODK22. The money will be spent on long term solutions. There will be no administration costs. The telephones are working again and today I talked to Ravindra. He said that all the employees in the company are safe, but a few are staying at a camp, so they may have lost everything. I asked him to take some pictures of places I know. I have not yet been able to contact the company, and I have only little information regarding the situation, today the 28th Dec. The company is not directly affected, as the water stopped 2 km away. I only know that Jayantha, Surendra, Ravindra, Ronnie, Saman, Ranjan and a few more are safe. Much of the coastal area near the company is completely flushed away. I don't know who and how many of the employees live in the destroyed areas. 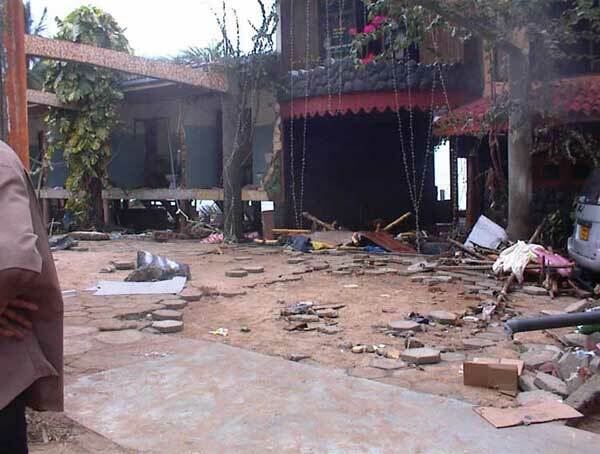 It seems that all of Unawatuna with hotels and tourists is gone, and parts of Galle city is destroyed. Many have emailed or called and expressed their compassion, and offered to help with money. I can't answer all directly, but I appreciate your concern. Today I have discovered that I need permission from the police before I can accept any donations, and tomorrow I will try to get it. Once I have found out how it is best arranged, I will announce it here. My first reaction was that I should go there immediately, and do whatever I could, but I would only get in the way. It is better that I do what I can to prepare myself for when I arrive as planned on the 21st of January. All the help we can give will undoubtedly be needed for a long time. At the moment all is chaos and the big organizations are dealing with the immediate problems. When the worst is over, there will be a need for helping individuals, and that's where I can really do something through my local "network", so the money does the most good, and goes to the right people. We have a "welfare fund" in the company that has so far only been used for smaller things. It will be well suited to handle actual needs when someone who speaks and writes English is added to the management. I will figure out what to do and how to do it, when I know more. So far I have mostly created some jobs and helped people help themselves. It has been encouraging to see the effects spreading. Now, the need for help is enormous. A good way to do that is to help small businesses getting back on their feet. It is important that as many as possible start earning enough to help themselves and others, because that will have the greatest effect, but there will also be many other ways. Even before this, many where in need of help and I have given serious thought to what could be done. Now, I have the advantage of knowing the conditions and an idea of what can succesfully be carried out. Earlier today I got through to Galle for the first time. I have regularly been trying to call everyone I know. I talked to Dr. Manjula, whom I visited in October at her Ayurveda hospital. She cried and was very happy to receive a call from Denmark. She feels abandoned and that noone is doing anything for the hospital. She said the hospital was "finished". It lies 100m from the ocean but sheltered by a cliff. Still, the lowest floor with pharmacy and treatment rooms is destroyed, but the building still stands. I doubt we can do anything for the hospital, but maybe we can help the employees I know, so they can have the energy to do something.